Book Awards in the past were simply news, I read the lists, felt pleased for the shortlisted authors and more pleased for the winners. Now that I’ve had the honour to be a participant in the process, I’m sharing my experience. A Finalist Reception the first evening provided an opportunity to meet each other before our four minute opportunity to ‘pitch’ our book. I found the time short but finished just as the bell went. After our reading each author was presented with their finalist certificate and evaluations. Not knowing what to wear for the occasion I wore the 1902 dress sewn for me to celebrate Elise’s life. I opened my envelope and read: Members of the Vancouver chapter of the Canadian Authors’ Association have selected the finalists according to four criteria: Ideas/Organization/Content, Style/Voice, Word Choice/Sentence Fluency, and Conventions/Production Values. I was thrilled to discover that For Elise earned 93 of the 100 points awarded. Following the selection of the three non-fiction tiles from the longlist the books went to two published writers, Susan Oakley-Baker and J. J. Lee. Their decision of the winning author was to be announced the following evening. Miji Campbell from Calgary won the non-fiction category. Many thoughts went through my mind following the announcement. It would have been wonderful to win, but I had learned too much to expect the judges to choose For Elise. It is a very unusual book, not exactly what book stores expect both in subject, style or size. I had willingly broken rules in order to tell the story my way. For instance, I needed to use footnotes, actual documents, and letters, to verify my account and then combine them into a story.. It took courage to break the Vane’s promise of secrecy and share it openly under the shadow of an already recorded Criddle family version. Nor do historians appreciate challenges to accepted history. Initially, my plan had been simply to learn more about our ‘vanished from history’ ancestor. The trail at first was very faint—a name, her birth and death dates and country of origin. But I uncovered much more, and with each new discovery the path became undeniably more tangled and troubling. The nameless woman had a name, Elise Harrer. She was an educated, talented woman, who survived many painful traumas. Through her and her children’s sacrifices, the Criddle family survived and thrived. Truth without anger was paramount as I wrote, but, her story needed to be told. The original documents supplied the truth and I carefully set them into context. I felt at peace. 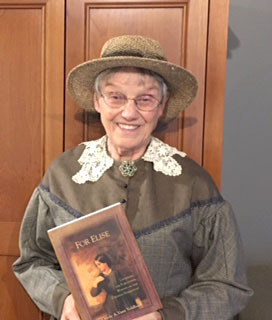 Back home For Elise‘s many fans had been sure the book would win, but they have accepted their loss graciously, saying, “For Elise is a winner with us.” I thank them. Both judges had positive feedback about the book. I quote some insightful comments from his review. Susan went on with advice of ways I could have changed the story to make it more marketable for a general audience. But I was not writing for profit. The general public are welcome to read the story, and have done so. But, I wrote this book for the Vane family descendants and their healing. I had but one opportunity to share my research and I included what I found. Elise’s, plus or minus, ninety living descendants have the whole story. I have achieved my goal. Perhaps another author can take my book and fashion it into a skimmed down version more palatable for the average reader as Susan suggested. I have been honoured and my life enriched by this experience. I thank the visionaries whose planning made it all possible. Traveling to Whistler with my husband Art to participate in the Festival will remain a treasured highlight. The awards were jointly administrated by the Whistler Writing Society and Vivalogue Publishing. The Whistler Independent Book Awards provided independent authors with a unique opportunity to have their work recognized through a juried process typically reserved for trade-published titles. This was the first, I hope other independent writers will take the opportunity to enter their book next season. Hi… Not writing but thinking! I have been intensely mindfully occupied with the drama of the recent election probably due to the fact that my late mom was fascinated with such politics. It may come out in another allegory similar to my previous writing.Did you ever read my Judge Wizzy, Get smart Wizzy, Wizzy’s Great Adventure etc (there is another one but i can’t recall the title!!!). I wrote them over 5 years ago or so…interesting how my mom’s fascination with Canadian and American news found it’ into my writing somehow. I’m sorry I’ve not followed up on your writing. i hope to now that I’m getting settled after all the excitement of our trip to BC. The election was upsetting for me in the light of my life’s work for disadvantaged children and women.